Trine 2 is coming and that means it's time for a Haiku contest, with with nothing less than poetic immortality for the winner! Surely you know by now that Trine 2 is on the way, the sequel to Frozenbyte's smashing good 2009 physics-y platformer in which a mage, a thief and a warrior combine, quite literally, to battle evil and save the stunningly picturesque kingdom. It's still hard for me to believe that this is the follow-up to the top-down horror-killfest Shadowgrounds, but that's how it is and it's great stuff. Not only will you get to show off your poetic brilliance to the world, but the best entry will actually be used in the game. 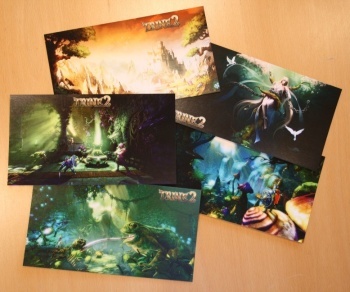 The winner will also receive a bunch of Trine 2 postcards, haiku'd and signed by the development team. There are details, of course, but it's all pretty straightforward. Entries can be submitted on Twitter, on the Frozenbyte forums or via email to competitions (at) frozenbyte.com. You have until October 27 to submit up to three entries and there will be much punishment for any "foul play." Get the full story at frozenbyte.com and then get haikuing!